Can you read Tarot accurately for yourself? The answer may surprise you, but with the right mindset and application – yes you can. Can you read Tarot for yourself accurately and should you do your own Tarot readings? I believe this answer is entirely dependent on individuals and their ability to step back and be objective. I have done my own readings with great success, however, there are times where I find the objectivity of another reader helpful. Simple spreads for general reflection or “what surrounds me” I find I can do easily for myself, however, there are times in life when we look to the cards for guidance of a higher order. Perhaps we are facing a life altering event or are under a period of higher stress than usual. In those instances, you can do readings for yourself, but it’s important to develop the right state of mind first. For me, I take a few minutes to clear my mind and focus on a mantra I developed. I use the world “TWILIGHT” and each letter stands for something: Truth, wisdom, inspiration, love, insight, guidance, highest good, trust. My symbolism here is that I want all answers to be surrounded by Truth. Twilight is the time of day where there is a transition taking place – not day, not night, but the period between. It symbolizes neutrality, potential, and faith in the natural cycles of life and order. Focusing and meditating on this before any reading (for myself or others) gives me the distance I need to be objective. When emotions are high, or there is a lot of anxiety around a question, there can be a tendency towards tunnel vision or seeing what one wants or expects to see, rather than the truth. Tarot reading is a highly intuitive process and difficult emotions can cloud our judgment and inhibit our ability to truly connect with our intuition. Other times, perhaps an answer is not clear or you want more insight into a situation. It may be best at those times to allow a third party to read for you because they may be able to see things that you are not allowing yourself to see. My advice is if you are feeling compelled to ask the same questions again and again, it is a good indication that your emotions are blocking your ability to accurately interpret and intuit your own cards. Ask yourself, am I asking this question repeatedly because I truly do not understand the results being drawn? Or am I doing it because I am not hearing the message I want to hear? 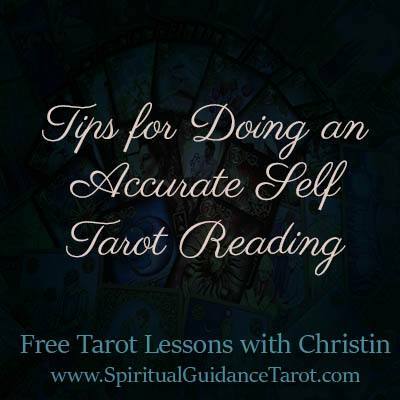 To do accurate readings for yourself, you have to be able to know when you are approaching your readings incorrectly. In addition, if you are new to the Tarot and are not fully comfortable with interpretations you may find that doing your own readings yields inaccurate results. Perhaps seek a second opinion from a more knowledgeable reader or have a professional reading done with a reputable Tarot reader. When doing your own readings be sure that you have a clear and focused question for the best results. It can be easier when we are drawing cards for ourselves to become distracted or let our minds wander away from the question at hand, which may yield inaccurate or unclear results in a spread as well.